How many young wives have made the bargain of being a dutiful, adoring wife to their husbands with the tacit agreement that his career is top priority? Countless, I would say, with most never realizing the long-term consequences of that bargain. That’s Joan in the ‘50’s as a wide-eyed English student at Smith College taking a writing course from erudite Professor Castleman. He praises her work—and asks her to babysit for him and his wife. During that time, she is introduced to a female writer of some note—but not really famous—who advises her not to write, because publishers (who, at that time, are men) will not take women’s writing seriously. Her books will end up only on university alumni shelves. The film opens on the cozy relationship between Joe Castleman (Pryce) and his wife Joan (Close), who have been married for years and have a daughter who’s pregnant with their first grandchild and a son, surly David (Irons), an aspiring writer. (Oedipal issues abound in the story, and are accounted for toward the end.) Soon, jumping-on-the-bed rejoicing comes after an early morning call from Sweden informing Joe that he has won the Nobel Prize for literature. We get an “all is (almost) right with the world” vibe from the couple, and they head for Sweden along with their son David, who seems to be wishing he were anywhere else. Clearly, Joan must constantly intervene in the men’s quarrels—which will make sense later on in the story. The rest of the film juxtaposes the luxurious Nobel surroundings and people with the Castleman family drama, one that realistically portrays the struggles families must undergo across time as new experiences and new events alter individuals in significant ways. Everyone must adjust—some do so successfully, some not so admirably. The Wife is based on a novel by Meg Wolitzer (screenplay by Jane Anderson) and skillfully directed by Bjorn Runge. Although I usually don’t like films going back and forth in time, that arrangement works here in giving us some information in the present, then explaining it by showing past events. The contrast between the Castleman couple’s coming together in the fifties and their experiences forty years later shows the turn of events that makes it seem topsy-turvy—but not if you pay attention to transitions. Humor, gut-wrenching interactions among characters, and apprehensions of all kinds keep the plot forging on while we sit transfixed, wondering how it will all turn out. All this is beautifully dramatized by the actors. 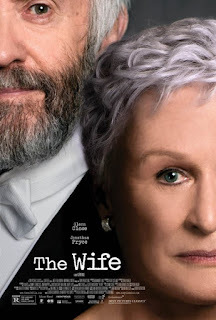 Glenn Close is exemplary in her role as a woman of substance: a delight, and a creative contributor, facilitator, arbiter, planner, and negotiator. She is deserving of a major award. As her foil, Jonathan Pryce is more than convincing as a self-obsessed dependent tyrant who has little insight in himself. Max Irons is talented in portraying a range of characters, from FBI rogue agent (TV’s “Condor”) to disenchanted son with mountains of resentment; and Christian Slater is up to his usual portrayal of a formidable persona.